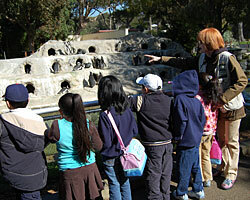 Do you want to teach people about animals and the San Francisco Zoo? 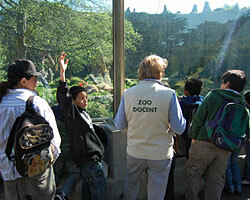 Become a docent and inspire future conservationists. 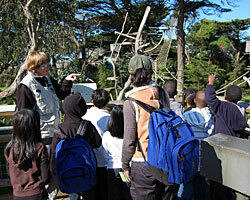 Docents support our mission by connecting guests to wildlife through informative talks, biofact presentations, and school tours. You can be a part of a vibrant community of volunteers who care about conserving wildlife. You'll meet new friends and learn all about animals from Zoo staff. To be a docent, you must be at least 18 years of age and you must participate in our docent training program, offered annually. In this 10-week course, you’ll be trained on public speaking, conservation, Zoo history and operation, animal care, taxonomy, and behavior. Docents are required to volunteer 10 hours per month. The next Docent Training Class begins in the spring. 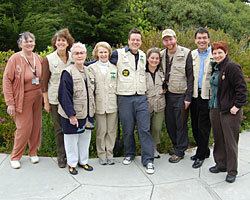 Please attend a Volunteer/Docent Orientation for more information; visit sfzoo.org for dates, or call 415-753-7122 or e-mail docent@sfzoo.org. Current Docents, sign in here. Need an account? Contact Chris S.